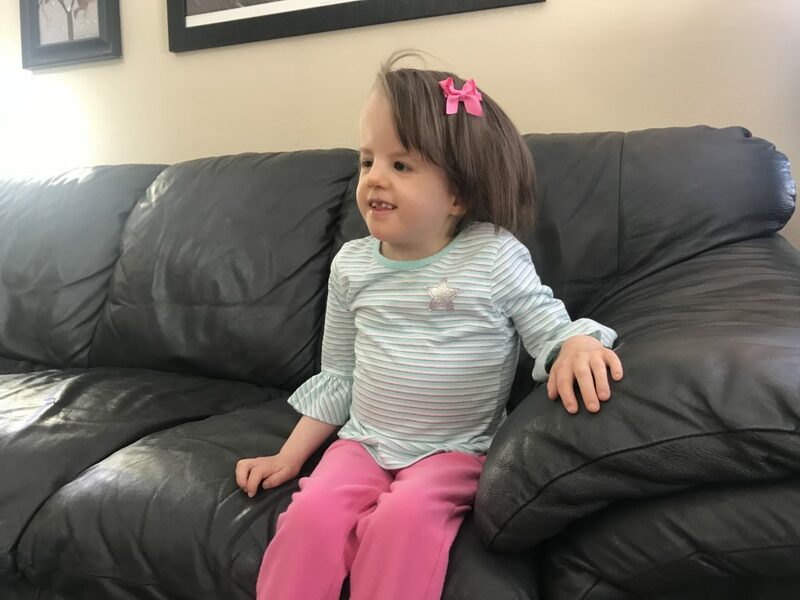 When Melody was born six years ago, the prognosis we were given for her life was that it would be brief. 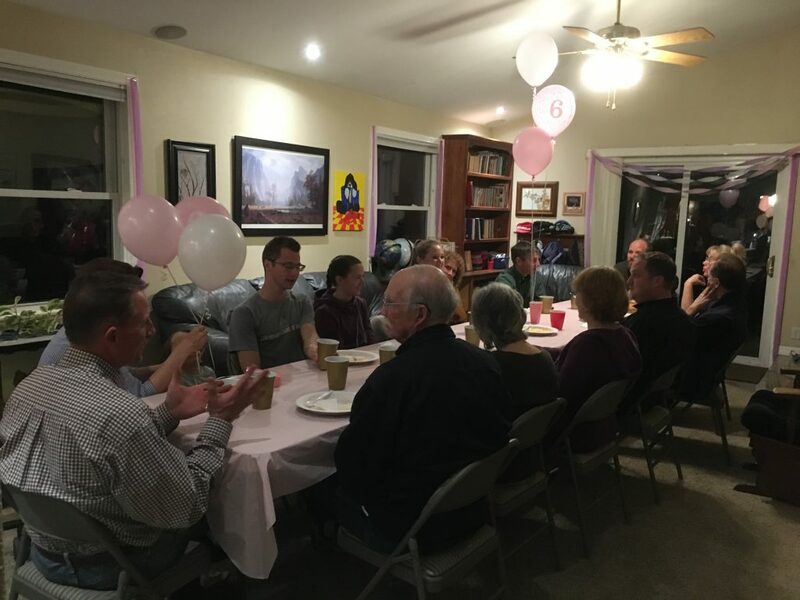 Since it appeared that we were not going to have the opportunity to celebrate annual birthdays with Melody we purposed to celebrate every day we had with our sweet and precious girl. Each week was a significant milestone and treasured as a gift. It is a beautiful thing when the little fragile ones amongst us know only love. Life is indeed precious. 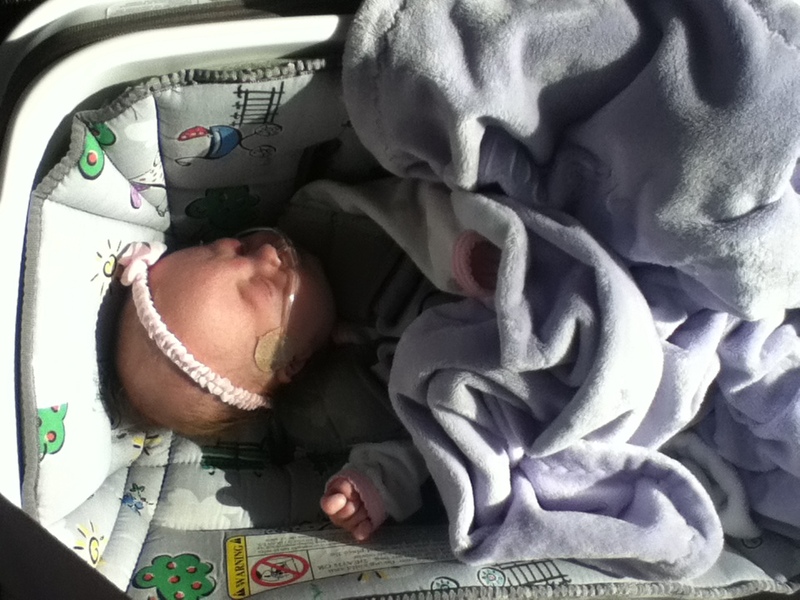 When Melody left the hospital as a newborn baby she was too weak for a standard car seat. She had a car bed. The day she came home the hospice nurse rushed to our house in a snowstorm attempting to arrive shortly after we did. That was an extraordinarily overwhelming time, and we were not sure why this meeting was so urgent. We found out later that things were expedited because there was concern that Melody would not survive the ride home. Melody not only survived that car ride home, she drives her own car now. 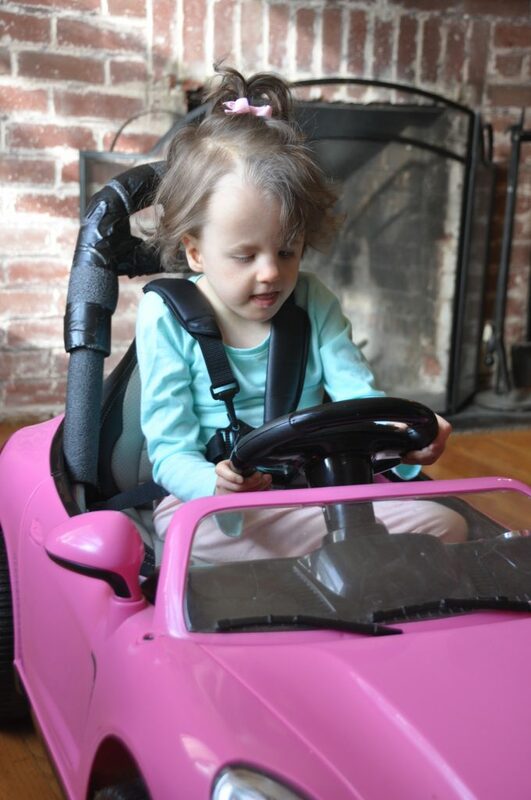 We cannot believe it has been a year since she made her grand entrance at her birthday party last year in her pink Porsche. Her driving skills have improved since then, thanks to a little coaching from her brother. 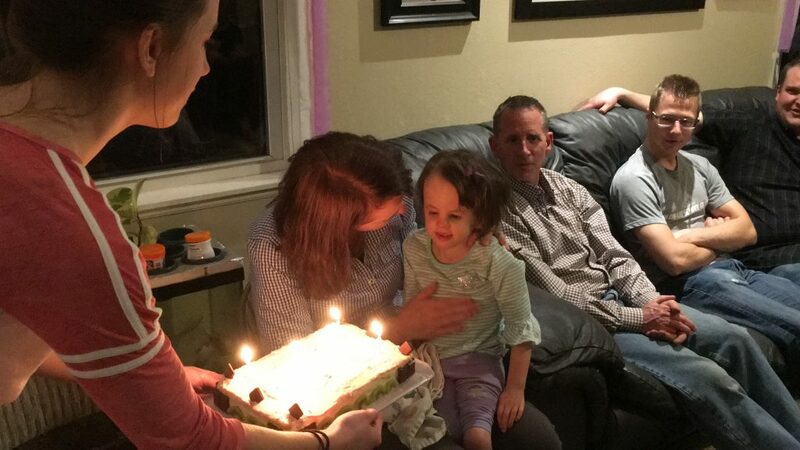 We recently had the privilege of celebrating Melody’s 6th birthday! To celebrate we had a meal, sweet fellowship, and a rip-roaring game of Melody Pictionary (Her sister made Pictionary cards with things that pertain to Melody’s life.) 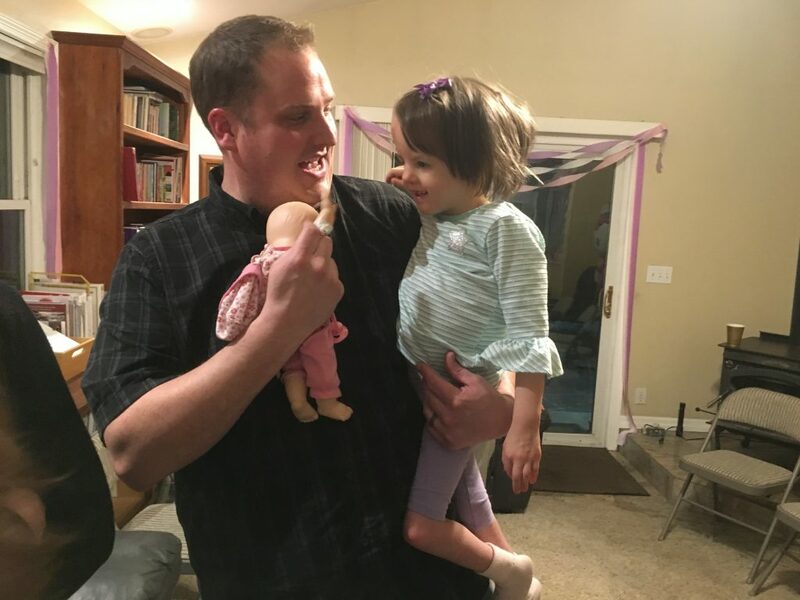 We had a wonderful time, and Melody was into her party more this year than she has ever been. She seemed delighted with the whole event. She had the sweetest interactions with Melody H.’s husband, Steve. He was working on Melody’s waving skills, perceptively using Melody’s doll as the teacher. Melody was quite engaged with Steve and was all smiles for him. 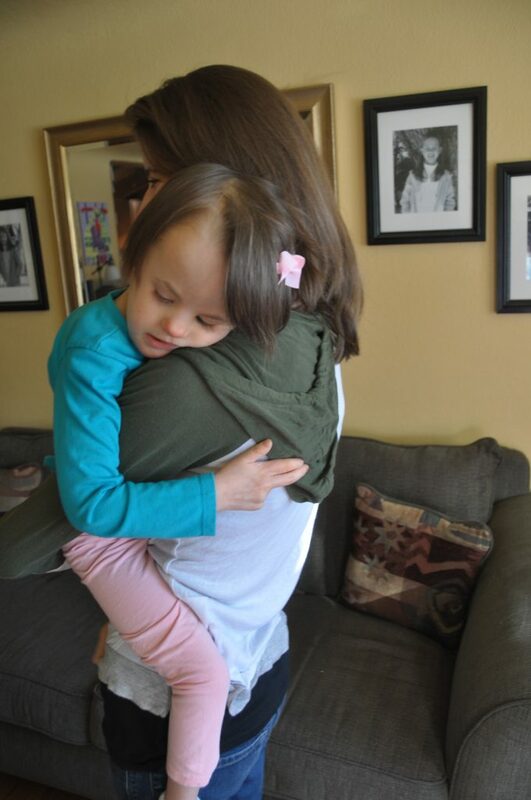 It was sweet to see her back in Melody H’s arms again. Another highlight for Melody was when Melody H.’s sister Angie (left of Melody) insightfully thought to have her play a jumping game. Melody was so excited about this activity! She now communicates almost daily that she wants to have her “jumping” time, which is so good for her on many levels. Melody’s oldest sister created a little birthday song when she was about nine years old. We have sung it to family and friends ever since then. It appears to be Melody’s favorite song. 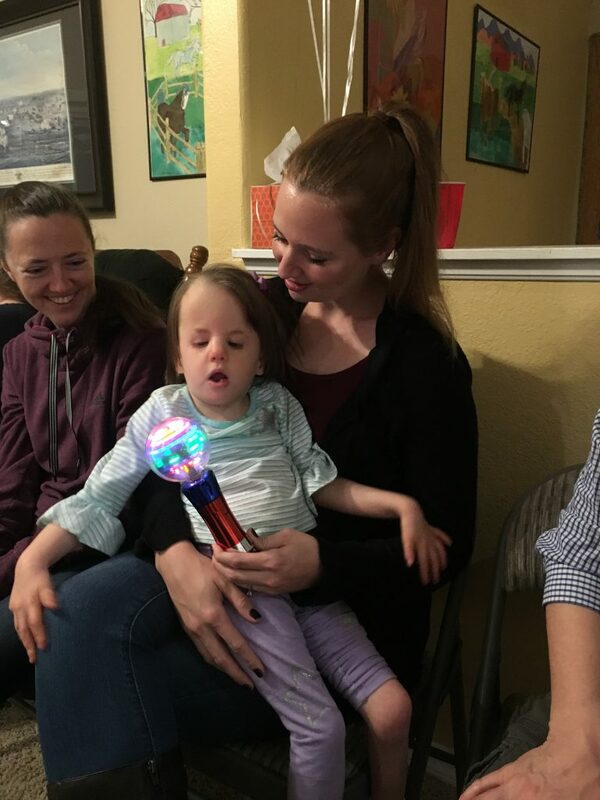 She lit up when her sister played it on the piano and we sang to her at her party. Steve and Melody H. gave her a pretty sparkly dress for her birthday. Melody wore it to church last week, and we realized she loves the feel of the fabric. 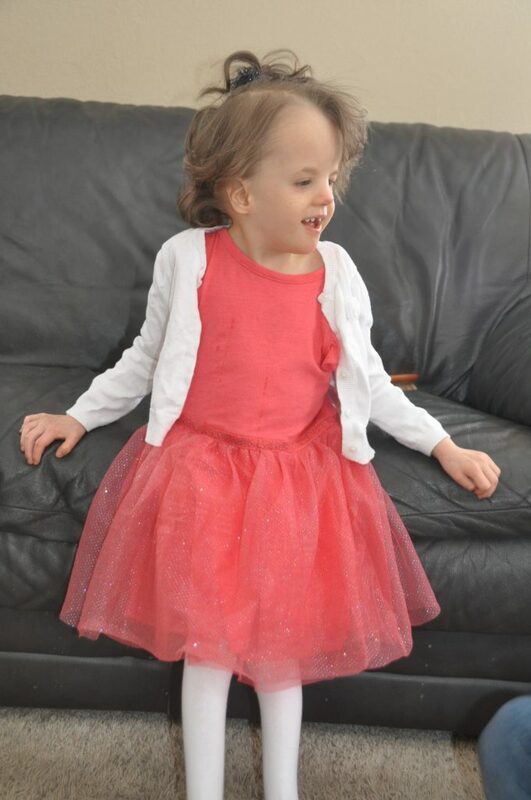 She is, as her speech therapist calls her, our little sensory girl. 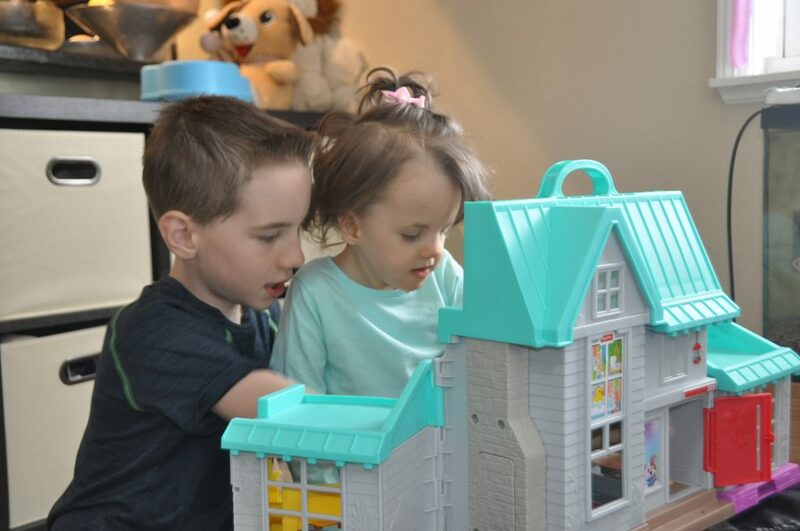 Her Uncle Joe and Aunt Karen gave her a new interactive dollhouse for her birthday. She loves it! She is so much more engaged with toys now. She is developing quite the personality. She smiles much more readily than she used to, and she is getting more playful. It is so sweet. As you can see Melody is missing her front teeth. She lost her 6th baby tooth the day after her birthday. She has two big teeth now and is working on getting the top two in. We will never claim these six years with Melody have been easy. Easy is not the goal. Love is. We have sacrificed. Yet, as my friend Lorrie has wisely expressed, “Often times the greater the sacrifice, the greater the love.” Melody affords us the opportunity daily to experience God’s grace to choose agape love. That has changed our perspective on life, and I mean that in every positive way. Her life provides depth, richness, and is certainly full of purpose. God alone infuses our lives with value, meaning, and purpose. Some in our culture think that there is a caveat to that principle for children with disabilities. Oh, to the contrary! There are plenty of things Melody cannot do. Yet, she has gifts that many others do not. She has this incredibly sweet ability to draw the love of God out of others. She captivates people with her smile, her laugh, her bright eyes, her silliness, her charm, her hugs, her love for everyone she meets. She can make people smile, laugh, and even tear up with the joy she brings. We have seen God work in her and through her mightily, particularly in regards to imparting understanding on the concept of the value of life. We anticipate with much joy all that lies ahead as her little life continues to glorify Him. Go Melody! God is so good. May God continue to bless you and your beautiful family! May you and your family have many Blessings in your next year of Life. You have added so much Joy to so many lives. HAPPY SIXTH BIRTHDAY, Melody! You just light up the world with your smile and you look absolutely beautiful in your party dress. God bless you sweet child! Happy birthday little Miss Sunshine!!! Six precious years to love you, to watch you grow, to cheer every accomplishment, to encourage every milestone. What a privilege is has been to be a part of every second of your amazing life. To God be the glory for allowing us to be a part of your miraculous journey so far. 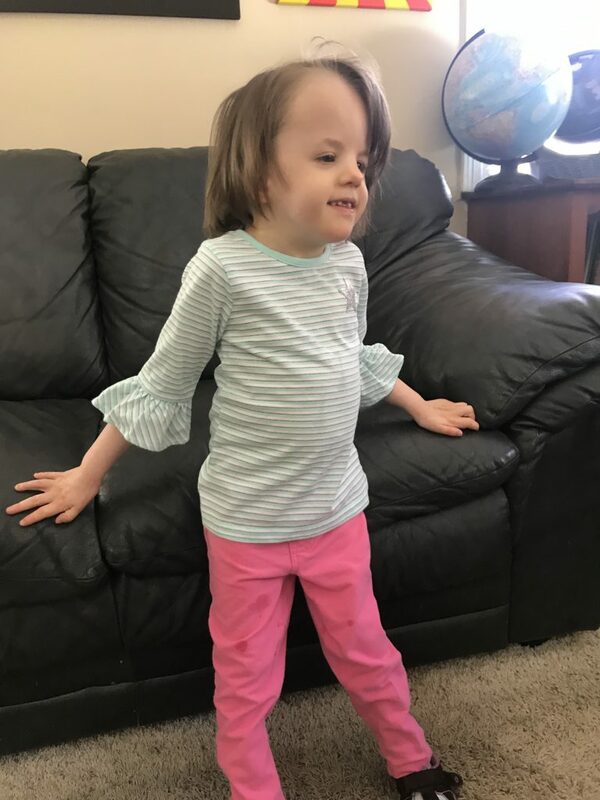 You are a beautiful little girl, Melody! You are surrounding by an amazing family, and their love and care for you touches me deeply. When I read about your milestones and adventures, I can’t help but get teary-eyed! I’m so glad that I get to be involved in your journey, whatever small part I can play. I’m very proud of you, kiddo, and very excited to see what this year brings! Thank You so much for keeping me updated through these beautiful postings!! I can’t believe it’s been 6 years since that day…….that day I drove through the snow thinking that I would have to provide comfort to this beautiful angel. She has provided so many blessings to so many people!!! 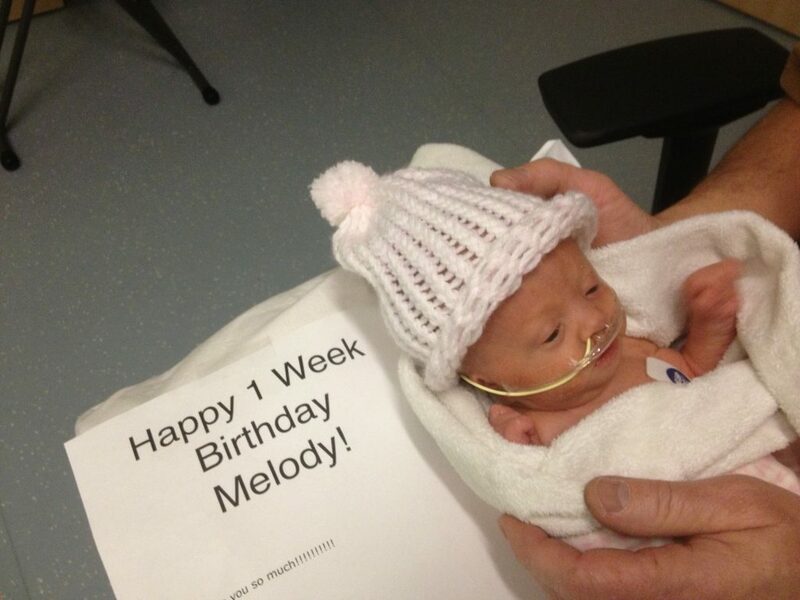 Happy Birthday Melody! May You continue to drive, smile and love so much more!!! What a blessing! Thank you for continuing to share Melody´s life and yours as well. May God continue to bless little Melody and your family as you and she minister to each other and all of us who are blessed to know you.